Today’s consumers have ever increasing choices when it comes to grocery shopping. The retail landscape is constantly evolving – whether it’s independent grocers like Nugget Markets, Sprouts or Fresh Market or e-comm options like Amazon Fresh, Instacart or Peapod. 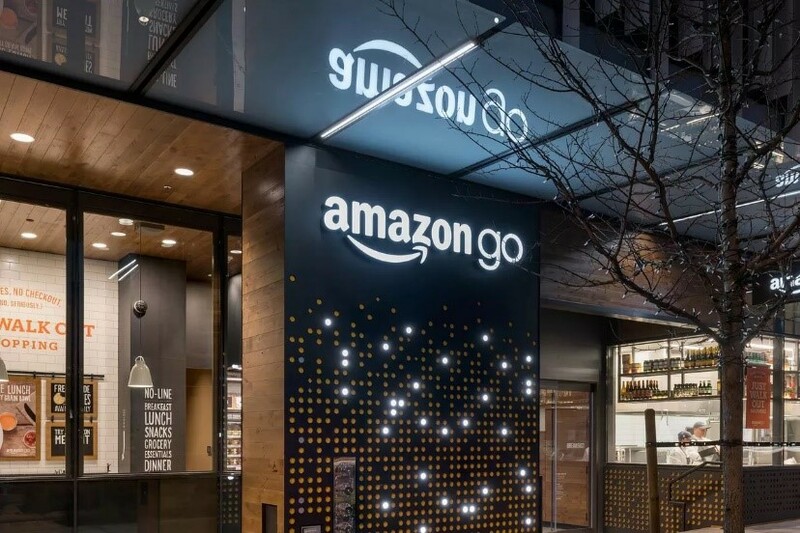 Amazon’s new brick and mortar store – Amazon Go is the newest arrival on the scene. Molly Manchester and I had the opportunity to check out Amazon Go in person when we traveled to San Francisco for the Winter Fancy Food Show. We went to the location on California Street on Tuesday, January 15 at about 6:00pm. First, let me say, what a fun experience! As marketing geeks and lovers of retail and food, we had such a good time. I will confess, it was a little confusing when we first walked in. A group of people were gathered in the vestibule, and we automatically assumed it was a line to get in. 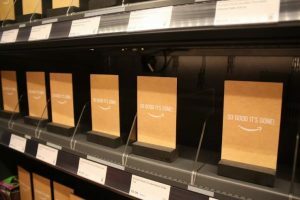 We soon learned that everyone there was simply downloading the Amazon Go app – which is required to enter. We followed suit and downloaded the app. The app is easy to download and links directly to your Amazon account. Once the app is downloaded, there is a bar code on the home page. Just scan it at the entrance turnstiles, voila! You’re in. The overall footprint of the store is relatively small, about the size of a typical convenience store. 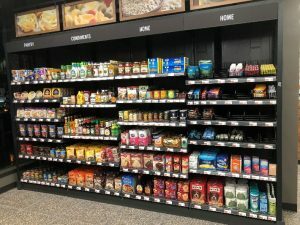 They have a wide variety of items ranging from grocery staples, such as bread, milk and eggs to quick meal solutions like meal kits and grab-n-go options like sandwiches and burritos. Of course, there are also cold drinks, candy and gum and ice cream. Additionally, they offer batteries, dog treats, spices and salad dressing and other miscellaneous items. There’s not enough here for a family to do a full shopping trip, but after all that’s not what it’s intended for. It’s more about fill-ins and quick solutions for smaller households to tide them over until they can do a standard grocery run. However, if you’re a single person living in the city, you could probably make this your primary grocery stop. That is, at least until you craved a wider option of foods. 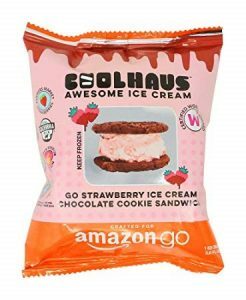 They also carry Amazon Go co-branded options such as Theo Chocolate and Coolhaus, which are priced at the same level as the standard brand offerings. The overall pricing was the thing that was the most surprising to me. I fully expected to experience pricing common to c-stores and city bodegas – forgetting momentarily that this was Amazon and not 7-Eleven. However, the pricing directly reflects Amazon’s standard cost models. I was very pleased to pay only 69¢ (before bottle deposit and soda tax) for a 12oz. can of Coke Zero. The overall experience was great. I hope these stores grow quickly as I would very much like to have one in my area. It looks like they still have some growing to do when it comes to keeping up with demand, as there was quite a lot out of stock in the prepared food section. But, the overall model would be perfect for the college campus environments. Other retailers have begun creating their own frictionless shopping experiences, including Walmart which has established “Sam’s Club Now” in Dallas, Texas. Sam’s Club Now is also powered by a corresponding app. These new, innovative and convenient shopping experience could transform the brick and mortar retail experience. However, for marketers this means less time to connect with the consumer. Marketers must adjust accordingly to this new shift to ensure they are able to reach the consumer before they walk out the door. Frictionless store models save consumers valuable time, allowing them to leave without standing in long lines. Marketers lose time to communicate with customers as they are browsing, which can also lead to a decrease in impulse purchases at the register. I’d say it’s a win either way.